Friday night: Mostly clear with lows in the 20s. Saturday: Clouding up in the late afternoon. Highs in the upper 30s and low 40s. Sunday: Snow begins early. Heavier snow possible by the afternoon. Winds gusting to 40 mph near Boston north, to 60 mph to the Southeast. 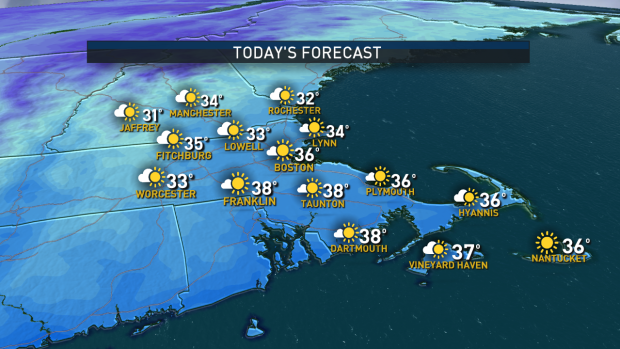 Highs in the low to mid 30s. Quiet weather is on tap for Saint Patrick's Day today as an area of high pressure approaches from the Great Lakes, ushering in light winds and dry conditions across New England. Highs reach into the upper 30s to near 40 degrees across the south and mid 20s north. Cold and clear tonight with high pressure cresting overhead. Lows bottom out in the low 20s south and single digits to the north. Clouds increase Saturday morning as a developing area of low pressure emerges from the Delmarva Peninsula. Temperatures will max out in the upper 30s south and around freezing to the north. A Winter Storm Watch has been issued for the Cape and Martha's Vineyard from Saturday night into Sunday morning. Expecting around 4 to 5 inches of snow across the cape and islands and a dusting to an inch across the Boston area to Worcester. Across the north, expecting only snow showers and flurries across southern New Hampshire and Maine. There is still some uncertainty with this system in regards to precipitation type with a chance of snow changing over to rain depending on how much warm air is around. 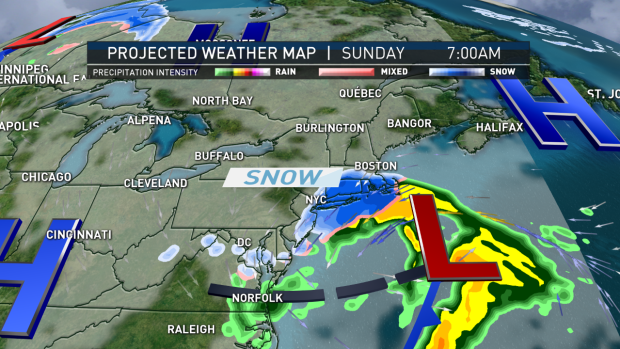 On Sunday, the storm system will be making its way offshore. Winds may pick up to 15 to 22 mph, gusting to over 40 mph across the Cape and Islands. Highs will reach into the mid 30s across the region. Partly cloudy skies will be around for the start of the work week as the weekend’s slow-moving coastal system continues to exit offshore. Highs will moderate back toward the climatological norm on Monday into the low 40s. Tuesday features mostly sunny skies with highs continuing to moderate to near 50 degrees. An arctic cold front traverses across New England on Wednesday. This cold front will bring a few snow showers across the North Country. Cold arctic air filters in behind the front with highs only reaching into the upper 20s to low 30s on Wednesday. High pressure builds into New England on Thursday.